Really? 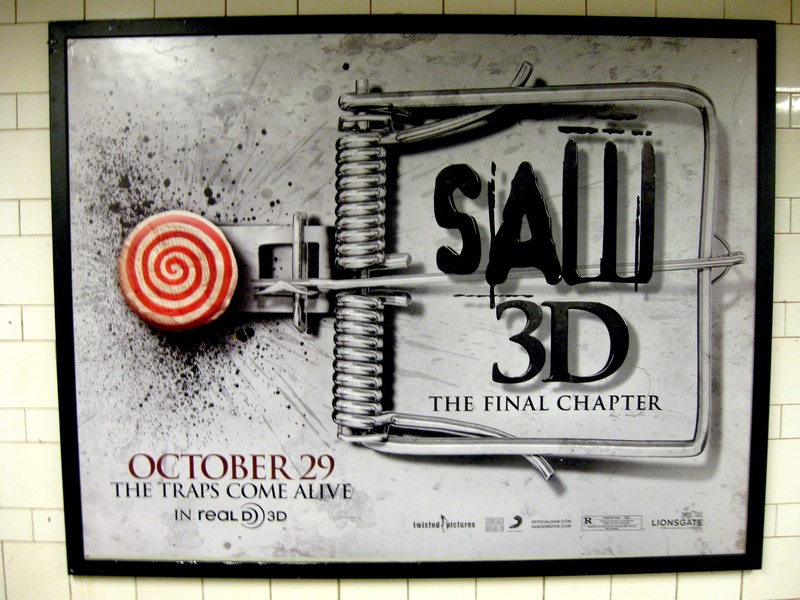 They're using a mousetrap for the SAW 3D poster? Not some kind of pointy thingamabob jumping out at us? Kind of seems like a missed opportunity. First of all, this is not a review. Sure, I could’ve spent last night at a midnight screening of Saw 3D and reported back to this blog with a critical analysis and handy star rating, but let’s be honest: No one cares what real critics think of Saw 3D, much less what my opinion of it is. After all, Saw IV got an astonishing 0% “Top Critics” rating on RottenTomatoes.com, and it earned back over three times its budget by the end of its opening weekend. So instead of wasting my time writing a review that would have no influence on anyone’s ticket-buying decision, I’m going to make a confession: I love the Saw series.